Experiments show that the type and population of microorganisms varies during the composting process. 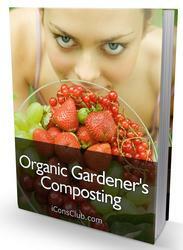 It is therefore critical to control the composting environment so that the microorganisms can flourish. The composting environment parameters include the compost pile temperature, moisture content of the compost, oxygen and carbon dioxide levels in the compost pile, and the availability of nutrients, including carbon, nitrogen, phosphorus, and potassium for the microorganisms. These parameters must be monitored, as they affect the vitality of the microorganisms. The temperature in the compost pile affects most directly the types of microorganisms and their functions. The type of microorganism changes as the compost pile temperature increases from its initial temperature to the mesophilic (25 to 40°C) phase, to the thermophilic (55 to 65°C) phase, and to the slow decrease in temperature following completion of the composting process. Experiments show that the thermophilic phase must be maintained for 3 to 11 days to produce a class A biosolid. It is during the thermophilic phase that most pathogens are destroyed. As the type of microorganism changes in relation to the compost pile temperature, so does its requirements for moisture and oxygen. The moisture content of the compost, oxygen and carbon dioxide levels in the compost pile, and compost pile temperatures are closely related; a change in one affects the others directly. Oxygen is supplied to the compost pile by the introduction of air, and the rate of air supplied depends on the moisture content of the compost pile: The higher the moisture content, the higher the rate of air is required. A minimum oxygen level must be maintained, while carbon dioxide levels must not be allowed to exceed a maximum level. As air is supplied, the porosity of the pile increases, which leads to increased evaporation and a resulting decrease in the moisture content of the pile. Supplying air can also lead to heat losses, which result in a temperature reduction within the compost pile. This temperature reduction results in a lower rate of decomposition functions. Therefore, the oxygen and carbon dioxide levels and the amount of air supplied must be monitored and controlled. Experiments indicate that the rate of air supplied is approximately 15 to 20 m3/h for each ton of organic material being composted. Monitors and controllers should be employed to supply air to the pile automatically when the carbon dioxide level within the pile reaches 8%. Design Example 7.2 A wastewater treatment plant (WWTP) with a design capacity of 40 million gallons per day (mgd) generates approximately 700 wet tons per day of thickened mixture of primary/waste activated sludge with moisture content of 97% (3% solids) or 21 tons/day of dry solids. The WWTP's dewatering system of centrifuges with polymer feed dewaters the sludge to a moisture content of 80% (20% solids). This reduces the mass of residual to 105 wet tons/day [(700 tons/day)/(20%/3%) = 105 tons/day]. The composting process utilizes the addition of quicklime and the addition of sawdust as a bulking agent. (Note: The utilization of polymer by dewatered raw residual is almost half of that utilized in dewatering anaerobic digested residual.) The addition of 2.1 tons of quicklime per day (105 tons/day x 2%) increases the pH to 10.5, removes the odor from the residual, and increases the temperature of residual. Temperature rise can be calculated using equations (7.29) and (7.30), which are repeated below. The duration of the composting period and thermophilic phase depend on process performance, quantity, and composition of the compost mass (i.e., moisture content, organic and chemical content of the sludge, type of bulking agent, viability of the recycled compost, etc.) and can last from several days to several weeks. For example, by using biodegraded wood chips and/or recycled compost, the temperature in the compost pile increases at a faster rate since these materials are already in a state of biodegradation. Quicklime added to the residual shortens the composting process by increasing the starting temperature through a chemical reaction. 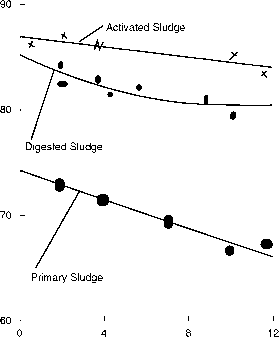 A comparison of temperature versus time during the composting of raw sludge with and without quicklime, and digested sludge without quicklime, is shown in Figure 7.14. The residual moisture content after the addition of quicklime can be calculated using equation (7.31), which is repeated below. 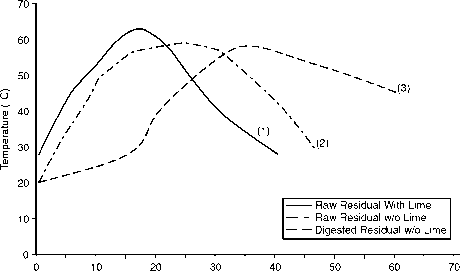 Figure 7.14 Comparison of composting with and without lime. The quantity of sawdust added is 105 tons/day (105 tons/day x 1.0) and recycled compost added is 21 tons/day (105 tons/day x 0.2). It takes several days to reach the thermophilic temperature (55°C) with the addition of quicklime. Maintaining that temperature for 10 to 11 days (Figure 7.14) provides the highest level of pathogen reduction/vector control and produces a compost meeting class A requirements. By comparison, an aerated static pile system requires longer composting time and more operational processes, resulting in a correspondingly larger area to store the composting materials. Also, compared with lime stabilization, the proposed composting process allows a decrease in the quantity of added lime to 25 to 33% of that required for lime stabilization.